When we started running heroics, we were bad. Both in gear and in encounter knowledge. That's normal, everyone has to learn the new things. The problem comes when someone stays bad after weeks. But that's not the point here. The point is that while we could easily kick bad damage dealers, there were no "damage dealer mutiny". Some very good players (who had top available gear and very good damage) whined on our - often laughable - mistakes, but when they were reminded that they can leave and find better tank and healer, they stayed and actually helped with advices. Hell, one guy who whined all run actually asked if we queue another because he'd come along. Why? Because there are much more available damage dealers than tanks and healers. If you check the random group finder, it always offers extra rewards for those who join as tank and healer. For this reason we (tank+healer) get in instantly. The queue for damage dealers is hours long. Because of this, if the tank and healer is not hopeless, the damage dealer need to consider himself lucky to have them. On the other hand the bad damage dealer can be instantly replaced as there are thousands wanting their spot. What would happen if the queue wouldn't be first-come-first-served, but give everyone what he wants: the best available teammates. Then the best tank, the best healer and the first 3 DD would form a team. Letting anyone else in would make the other 4 unhappy. After they left, the best tank, the best healer and the first 3 DD from the remaining people would from a team. Then the next batch. Then the next, until all tanks are gone and the remaining people (about the bottom 20-40% of the healers and the bottom 60-80% would never get a tank. What does it tell us? That simply being competitive and being good is not the best strategy. You should be in a needed position. Being a mediocre tank increases not only your chances but the "player GDP" (measured in dungeon boss kills), since every new and acceptable tank opens up another team. On the other hand a good damage dealer simply pushes out a worse one and increases GDP only marginally (by making his team work faster). This is - yet again - a real world phenomena manifesting in a game, and an important advice for all people looking for profession. Don't just look what you like and what you are good at. Look for fields that have worker shortages! PS: I wonder why people keep 30B in a ship maintenance array. I also wonder why don't they unanchor it if they can't defend it to deny the killers loot and bragging rights. As a damage dealer druid, i can run 3-5 instances an evening (±20 min queues) while finding things to do in between without getting bored or falling asleep. Last time i went bear, i literally fell asleep on the keyboard from sheer boredom. Also, in current WoW you can get much better gear with crafting than heroics. Crafting is limited by creating the soulbound reagents. One ilvl 640 leather armor takes 100 Burnished leathers and you get 2*6 from the building (with follower working) and 1 from yourself every day. Because you cannot unanchor SMAs when there's something inside. You can of course offline it, but not unanchor. Hangar arrays are the opposite IIRC. You can unanchor them and everything inside is destroyed. I generally play the role of healer in most games I play. It comes naturally to me. 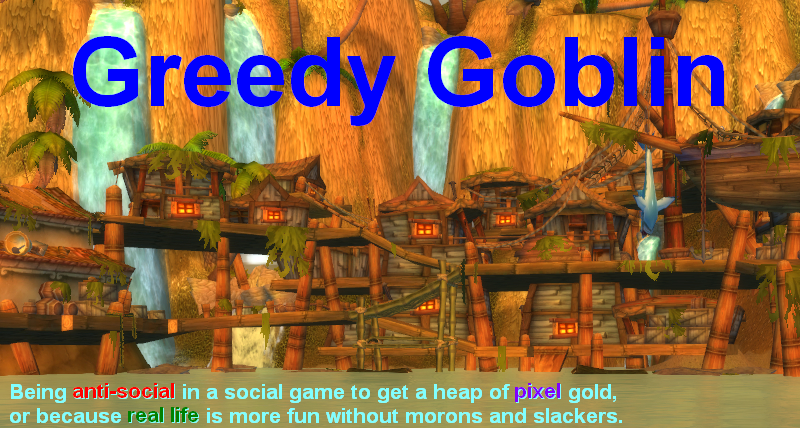 Unfortunately, I never found it rewarding in WoW because finding a good group was next to impossible. Perhaps things have changed since I have not touched WoW in years. Oh... and that wormholer was running low on Synthcoffee. Had he stocked more he might have been awake. Tanks have always been in high demand for 5 mans. Everyone's always looking for tanks for 5 mans but when it comes to raids, finding a decent raid is actually harder for tanks (even good ones) than for anyone else. The problem is 5 mans require 1 out of 5 players to be a tank but raids only 1 or 2 tanks out of 20 players. DPS and healer ratios don't change much, in fact they get slightly better due to gaining 2-3 more spots for dps and/or heals that would have been taken by tanks in 5 mans. So tank burnout. Good tanks are constantly being asked to help out with 5 mans. Many eventually get fed up with it (especially if they're having trouble finding a decent regular raid group) and just stop doing 5 mans altogether. I understand crafting gives you 5 or 10 a day, depending on LW level. You can also turn in Primal Spirits (which are farmable), though you are really better off saving them for Blood. Point is, heroics are only a fraction of gearing for really competitive people. Not even a significant fraction, at that. @Anonymous: but you can man the ships inside and self destruct them under the POS shield for the same effect. Gevlon, there was no POS shield. Look at the killboard for the loser corp. No POS kill precedes all the module kills. That is, they must have let their POS run out of fuel. In fact the lucky corp which found it killed an Impel to kick off the killing ... an Impel that was carrying Amarr POS fuel. And then an Occator carrying Caldari and Amarr fuel. That is, they maintained enough hole control to keep the loser corp from getting fuel to the tower. There are also a couple kills of people in ships, presumably their logout ship. All of them were podded. A bit of nostalgia: I hope all hybrids that wanted dps are now happy, being no longer "special", but just a dime in a dozen.